By Audrey Golden. Oct 24, 2016. 9:00 AM. This December will mark the 45th anniversary of Pablo Neruda’s acceptance of the Nobel Prize in Literature. To honor the poet’s global reach through his leftist politics, an exhibition of Neruda works and objects from 40 different countries will be on display in the Sinclair Galleries at Coe College in Cedar Rapids, Iowa. At a moment in which individual involvement in global politics appears both necessary and impossible, Neruda’s works remind us of the power of language to resist tyranny and oppression, and to imagine a world in which human equality and dignity thrive. 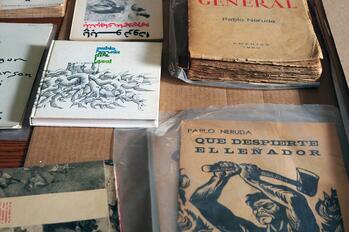 The exhibit is entitled, Index of Influence: Archiving Pablo Neruda’s Poetry and Politics. Open daily from 4:00 p.m. to 6:00 p.m. 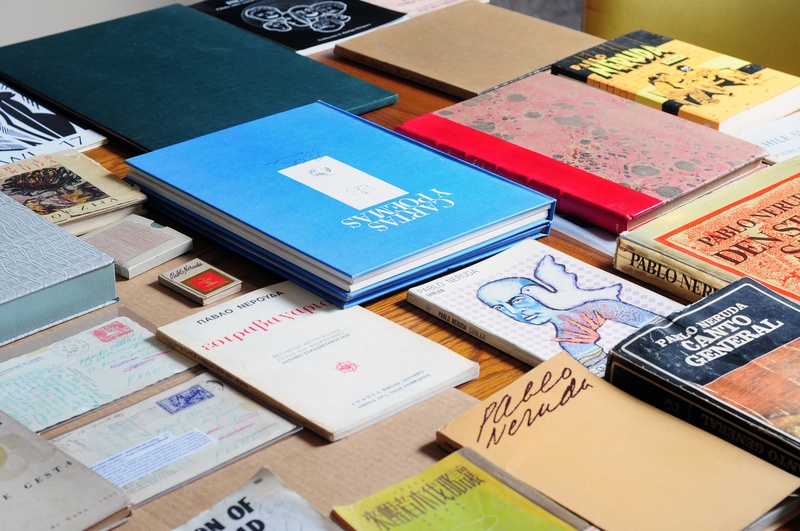 The materials in Index of Influence are highlights from the personal collection of Audrey J. Golden. In 2014, the collection won third prize in the Library of Congress’s National Collegiate Book Collecting Contest. Audrey J. Golden currently is an Assistant Professor of English at Coe College, where she teaches a wide variety of courses in twentieth and twenty-first century global Anglophone literature. The exhibit is co-curated by Golden and Ranelle Knight-Lueth, Assistant Professor of Art History at Coe as well as by Emma Steinkraus, the Gallery Director, and Sara Nieland, Assistant Gallery Director. Exhibition highlights include a first edition of Canto General (1950), originally published in a run of only 300 copies in Mexico City by Talleres Gráficos de la Nación, with signatures from Neruda and Mexican muralist painters Diego Rivera and David Alfaro Siqueiros, who designed the frontpapers and endpapers for the book. In addition to work in Spanish from across the Americas, the exhibit also features works by Neruda in various translations from South Africa, Australia, Japan, China, Lebanon, Iran, Serbia, Germany, France, Italy, Norway, Denmark, and Sweden—to name just a handful. Many of the objects feature original inscriptions from Neruda, including items formerly in the personal collection of French poet Paul Eluard. “Each and every one of my verses has chosen to take its place as a tangible object, each and every one of my poems has claimed to be a useful working instrument, each and every one of my songs has endeavored to serve as a sign in space for a meeting between paths which cross one another, or as a piece of stone or wood on which someone, some others, those who follow after, will be able to care the new signs . . . . The materials gathered in Index of Influence help to make tangible the importance of Neruda’s work, honoring the poet’s lifetime of politics and poetry.